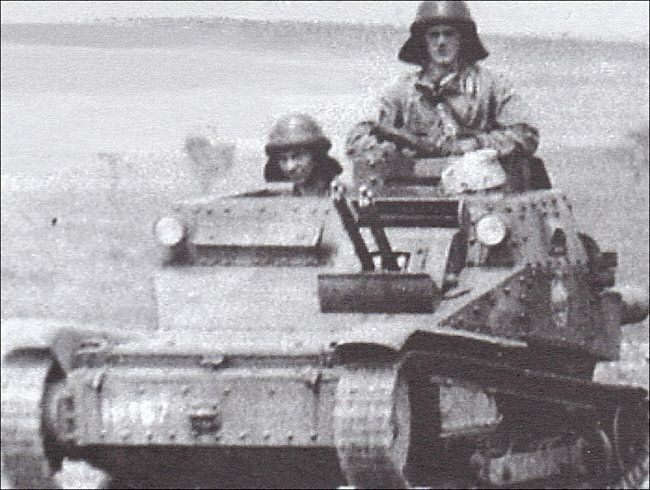 This L3/35 Italian tankette was modified by the Hungarian Army by the adding of a square commander cupola. This is why it has the designation L3/35M. It was was captured by the Soviet in the Hungarian military barracks at Piliscsaba. Its serial number is H-153. 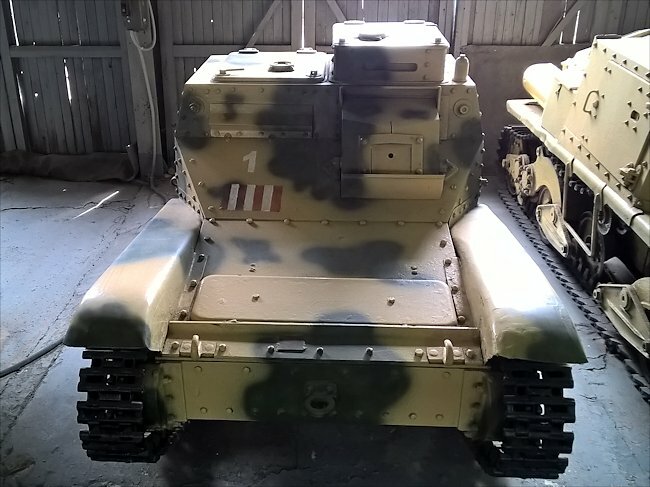 This Preserved Carro Valoce L3/35M Tankette can be found at the Kubinka Tank Museum in Russia. The twin machine gun unit is missing. Many of the tanks of WW1 and those built during the 1920’s and 1930’s were only armed with machine guns. They were to act as mobile machine gun posts and clear the way for following infantry. Few senior army officers gave thought to tank on tank engagements. The early armoured tracked machine gun armed tanks like the British Mk IV female tank, the Whippet or the German LKII where large vehicles that moved slowly across country. Their high profile meant they could be spotted easily and targeted by anti-tank guns. The French Army’s machine gun armed Renault Ft tank was smaller and faster than the others. It spurred on the development of more fast moving small machine gun armed tanks to act as reconnaissance cavalry vehicles and provide infantry support. This Preserved Carro Valoce L3/35M Tankette can be found at the Kubinka Tank Museum in Russia. Not the unusual raised commanders cupola. The British company Carden Loyd produced a pre-world war two tankette. A number of different variations were made, including the Mark VI that saw service in northern Europe during the 1940 Battle for France. The Carden Loyd tankette chassis was built under license in a number of different countries including Italy. It formed the basis of the Italian light tank series L3/33 (CV-33), L3/35 (CV-35) and L3/38 (CV-38). At first these tankettes used the letters CV which were an abbreviation of Carro Veloce which in Italian means fast tank. In 1938 the Army decided to change its tank designation system because of the introduction on bigger medium tanks. The tankettes were now given the prefix letter L which was the abbreviation of the Italian word Leggero which means light in English. The Medium tanks were assigned the letter M i.e. M13/40, M14/41 or M15/42 tank. The number 3 indicated how many tonnes the tankette weighed. The following two numbers represented the year that that armoured vehicle was accepted into service of the Italian Army. 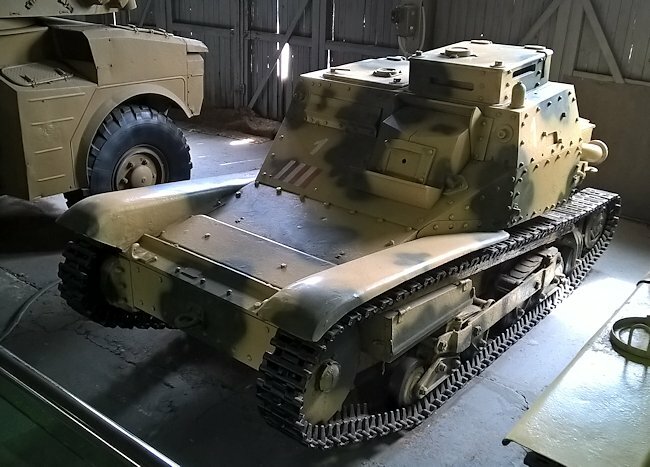 This Preserved Carro Valoce L3/35M Tankette can be found at the Kubinka Tank Museum in Russia. It was based on a British Carden Loyd design. The Fiat Company of Turin and the Ansaldo Company of Genoa built the first tankette in 1933. It was called the Fiat-Ansaldo CV-33. Around 300 CV-33 tankettes were built. A new model was introduced in 1935. Its armour plating was bolted rather than riveted. It was fitted with twin 8mm machine guns rather than the single 6.5mm machine gun. Some of the older CV-33s were upgraded to the CV-35 armourment specifications by the removal of the single 6.5 mm machine gun and the fitting of the two 8 mm machine guns. In1938 torsion bar suspension and a single 13.2 mm Madsen machine gun were fitted to the tankette. This version was known as the L3/38. 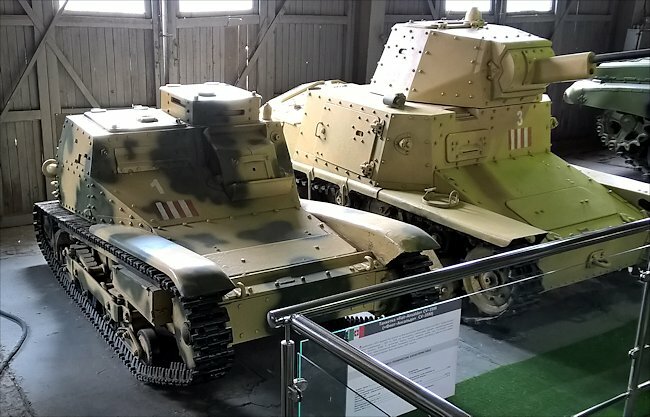 Between 2,000 to 2,500 L3 tankettes were built in different models and variants. They were used almost everywhere that Italian troops fought during World War II. L3s were found on the Italian/French border, North Africa, Italian East Africa, the Balkans, USSR, Sicily, and Italy. They were also sold to other countries. This L3/35 was captured by the Red Army in 1944 on the Eastern Front. Their troops had been fighting Hungarian armoured units equipped with Italian CV-35M tankettes. This combat vehicle was designed to fight enemy infantry units and act as a low profile reconnaissance vehicle. It was not engineered to engage in tank on tank combat. Many historians sing the praises of the British Universal Bren Gun Carrier and at the same time give bad reviews of the Italian L3 series of tankettes. This I find strange. If a British Bren Gun Carrier had to engage in combat with a Panzer II or III tank it would loose. Hungarian modified Italian L3/35M Tankette with raised cupola and 34/37M 7.92mm Gebauer twin machine gun unit in a tiltable 'bukotorony' mount. In the Spanish Civil War L3/33 and L3/35 tankettes were used by the Nationalist Corps of Volunteer Troops (Corpo Truppe Volontarie, or CTV). The Spanish Republican communist forces were equipped with the latest advanced Russian T-26 and BT-5 tanks, both of which were armed with 45mm guns as well as machine guns. They knocked out many Nationalist tankettes. Of course these Italian made tankettes were out-classed. The Army commanders should not have put the crews into the situation where they had to engage these enemy tanks without medium tank and artillery support. They had no way of inflicting damage on them. When Italy entered World War Two in June 1940 their army only had about one-hundred M11/39 medium tanks in two tank battalions. L3 tankettes still equipped all three Italian armoured divisions, the tank battalions in the motorized divisions, the light tank squadron group in each ‘Fast’ (Celere) division, and numerous independent tank battalions. When used to attack enemy infantry positions and soft skinned vehicles they performed well. The problem was that the British soon found out that they could use their Boys anti-tank rifle to knock and infantry 2pdr anti-tank gun to out L3 tankettes. All the British tanks in use in North Africa in 1940 could engage and destroy the Italian Army L3/33 L3/35 and L3/38 tankettes without incurring significant damage. Very few Italian Army L3s remained in front line service from the beginning of 1941. They were used for internal security and airfield protection duties. Where can I find preserved L3/35 tankettes?